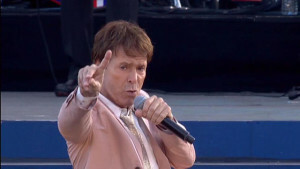 At the Diamond Jubilee Concert in London on 4 June, Sir Cliff Richard was among many stars performing for HM Queen Elizabeth II and other members of the British Royal Damily. Sir Cliff Richard performed Congratulations as part of set of songs to help celebrate the Diamond Jubilee of Queen Elizabeth II. This concert was arranged by musician Gary Barlow. As we all know, Congratulations controversially came second in the 1968 Eurovision Song Contest at London’s Albert Hall to La la la by Massiel. It has since become a world wide standard and one of the most well-known songs ever to be performed at a Eurovision Song Contest. Sir Cliff also performed other songs from his 54 year singing career. Among the other performers was Sir Elton John, who wrote a song for the UK’s Song for Europe competition in 1969 with his songwriting partner Bernie Taupin. The song was Can’t go on (living without you) but only finished 6th out of 6 in the national selection. Australian entertainer Rolf Harris was one of the guest presenters of the Diamond Jubilee Concert. He was the presenter for the BBC’s 1967 Song for Europe competition when Sandie Shaw performed all six songs and Puppet on a string was chosen by a public postal vote. He also commentated for the BBC at the 1967 Eurovision Song Contest in Vienna, which was won by Sandie Shaw. For viewers in the UK, the Diamond Jubilee Concert can be watched on the BBC’s iPlayer facility here.